Matte finish stainless steel case with solid case back. Sapphire crystal with luminous hands and hour markers. Watch is water resistant to 500 meters and is suitable for diving. 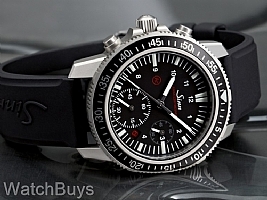 This watch is fitted with a Sinn silicone rubber strap with tang buckle. "Great dive and chrono watch"
Verified Owner Comments: It is really nice to have a 60 minute chronograph dive watch. The tool watch aesthetics of the watch grow on you and the watch with the rubber strap is very comfortable to wear. At a diameter of 41.5 mm, the watch is not overly large nor thick. 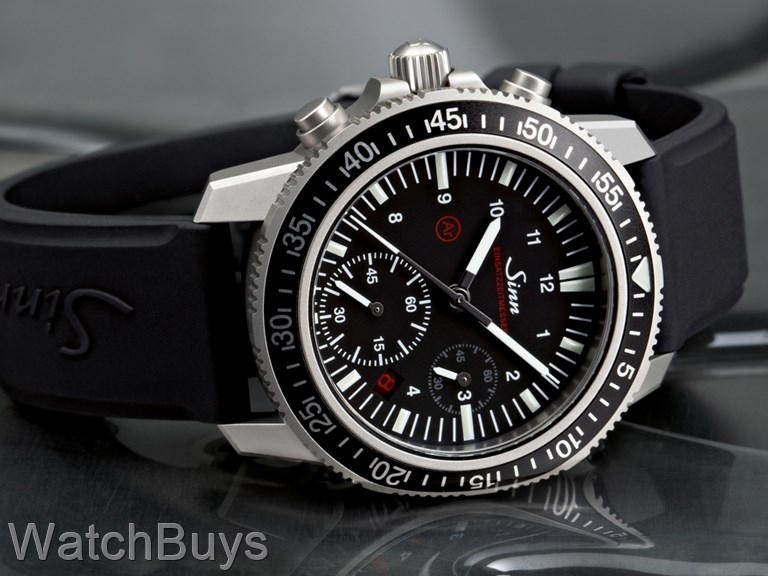 Verified Owner Comments: This is my second Sinn from Watchbuys. It doesn't disappoint. It has a very solid feel and the look is somewhat minimalist. It reminds me of my 1987 Porsche 911. It's all business. The ONLY downside is the red date which is unreadable in low light and the fact that the pusher position functions are counter to what one would usually expect—the bottom pusher starts the chrono while the upper does the reset. Note that the rubber strap must be cut to size the watch. This watch will not attract attention which may be a good thing. This is a very solid piece of kit. Verified Owner Comments: World class product and service. This watch is a dive, pilot, chronograph in one package. There is nothing to dislike. Verified Owner Comments: I absolutely love this watch!! I had never seen it in person, but had read quite a bit about Sinn watches, and at least visually, liked this one best. I could not be happier with my purchase. It looks great! The silicone strap is extremely comfortable and well made. Even though the watch has some heft to it, you do not feel it when it's on your wrist. If you like the looks of the watch, take the plunge! You won't be disappointed. Verified Owner Comments: The staff is top notch, they will spend as much time as needed on the phone or email to help you throughout the purchase process.